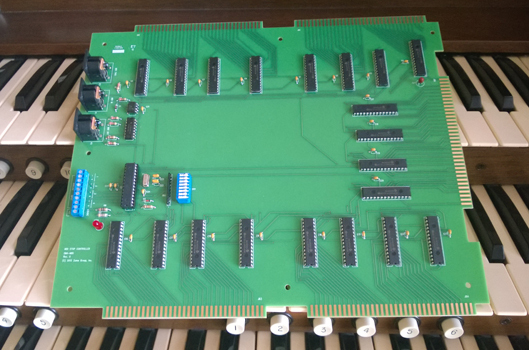 Adding full midi functionality to Allen organs using the DM series memory capture boards just became easier. Simply unplug the old board and plug in our DM-MIDI board in its place and you have full bi-directional stop control for your virtual pipe organ in minutes – no wiring or additional modifications required! Bi-directional control means that stop changes made on your physical console are sent as Midi messages to your virtual organ and that stop changes on your virtual console are reflected back on the physical console as actual stop movement ensuring that your virtual and physical console are in perfect sync. This YouTube video shows the playback of a Midi file on Hauptwerk. Hauptwerk sends midi messages to DM-Midi board to control the stops on the physical console. When you use the DM-Midi board in your installation, you’re freed from the limitations of the old dual memory system and free to enjoy the vastly superior multiple bank memory systems including stepper sequences and scoped pistons. The DM-Midi board moves the memory off of the board and onto your computer to be managed by your VPO software. The DM MIDI board automatically switches between three modes of operation to suit any performance scenario. When you use the DM MIDI board in the full MIDI mode, you’re freed from the limitations of the old dual memory system and free to enjoy the vastly superior multiple bank memory systems, including stepper sequences and scoped pistons, provided by modern MIDI VPO software. In this mode the DM-MIDI board moves the capture memory off of the board and onto your computer to be managed by your VPO software. The legacy standalone mode provides the same dual level combination setting capability as the original board using onboard non-volatile memory for those instances when you want to play without connectivity to any external MIDI devices. The split mode also utilizes the board’s internal dual level capture system but sends MIDI stop and piston information messages allowing the combination action to be used with MIDI devices and software lacking capture capability. Enjoy the full capabilites of your VPO software from the console of your Allen organ. Order your DM-Midi Midi Stop Controller board today! This product is a replacement for DM series dual memory capture boards originally found in some, but not all, Allen MOS-1, MOS-2, ADC, and MADC series organs. Verify that your organ is using a DM series capture board before ordering this product. 1These features require addtional user wiring.